Now if go to bios what to choose? but I can Not boot in windows ... is any setting or have to insert acronis bootable media... to do boot in windiows 10 ??? 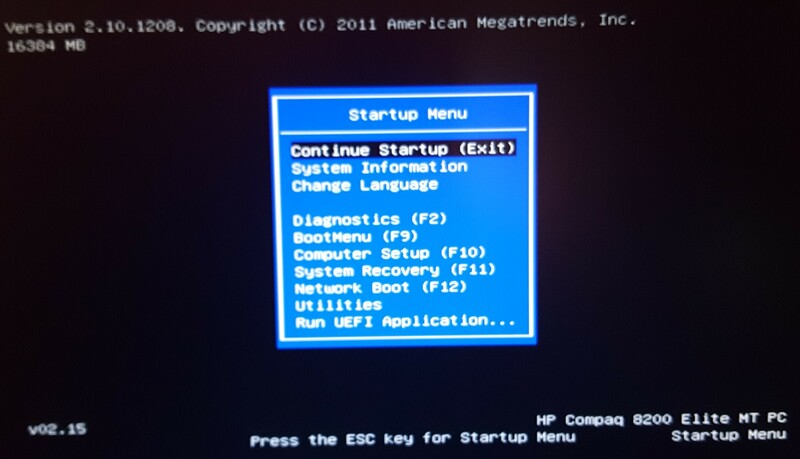 Leonidas, have you tried using either taking the top 'Continue Startup (Exit)' option on the Start menu, or else taking the top EFI Boot Sources > 'Windows Boot Manager' option on the F9 Boot menu? 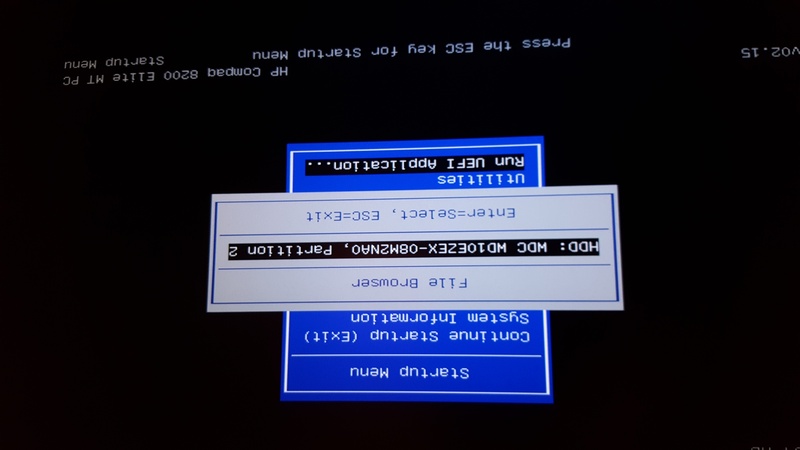 Early in this topic you posted the output from msinfo32 which showed that your Windows 10 OS used a BIOS mode of UEFI, so the above options should be correct to start Windows. and boot with ssd????? but hdd problem now ,, well ? Are you able to boot to the Windows 10 desktop after booting with with Acronis DVD is present? And recover backup to ssd from bootable media? Also try if enter windows 10 from bootable. ..? You can retry the recovery to the SSD from your backup drive using the bootable media but doubt that you would get into Windows 10 from the bootable media. 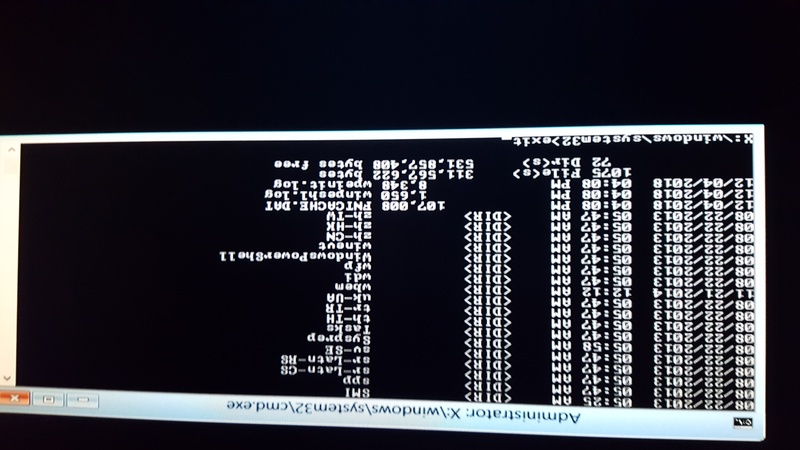 The command line (x:\windows\system32> ) looks to be either from the Acronis Rescue Media. When you did the earlier recovery to the SSD did ATI request that the system had to be restarted to continue the recovery? bootable media is not the same as rescue media???? I have and bootable media try these???? Bootable media and Rescue media are the same thing. If you are able to boot into the Acronis Startup Recovery Manager (ASRM - F11 prompt) and have your backup drive connected, then I would suggest restoring just the MBR & Track 0 data from your last backup image to your HDD, to see if that will resolve the boot issue with the HDD. But if is GPT the MBR needed ? doubt that you would get into Windows 10 from the bootable media. If enter Acronis bootable media... and having USB 3 SSD & ext HDD (with backup in it] ... can i try recover backup lastest to SSD ... without enter Windows... ??? After connect SSD [sata] to see if boots up? When in the Acronis Rescue application and looking at your backup image, what options do you see for the items available for recovery? If you only see the EFI partition plus your C: & T: partitions, then try restoring just the EFI partition back to the HDD. The alternative approach here will need a copy of the Windows 10 installation media and then to try running a Startup Repair or to Repair Windows from that media. See the following webpages dealing with repairing a UEFI / GPT Boot issues. Webpage: How to Repair EFI Bootloader on a GPT HDD in Windows 7/8/8.1/10? If you do not have a copy of the Windows 10 installation media, then you can download this from webpage: Windows 10 Download - where you should use the second option to Create Windows 10 installation media by downloading the Media Creation tool. So you mean efi partition needed recovered ? And if do this is for the better health of hdd... not worse? 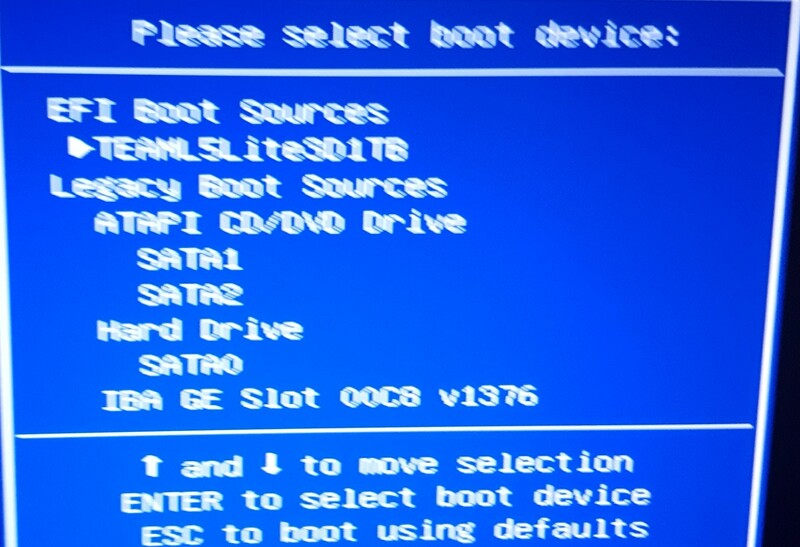 What about the option recovery of backup in ext hdd to ssd and try sata boot from ssd... when do this? After connect ssd and recover to ssd..? Leonidas, my focus here has been to try to help you get back to a working HDD. I do not know why you are not able to boot from the HDD when you were just recovering your backup to the new SSD drive. The HDD should not have been 'touched' by this process unless ATI required a restart when doing the recovery, which then would have created a temporary boot environment from which to boot and perform the actions. This is one reason why doing OS Recovery (to the original drive) is not recommended from within Windows! 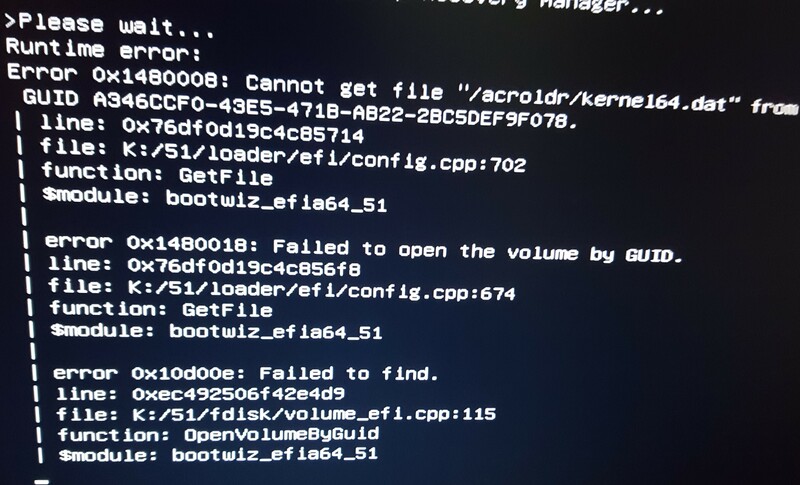 The suggestion to recover just the EFI partition to your HDD is to try to resolve this new boot issue. If you prefer to try to get the new SSD working instead of the HDD, then booting from the Recovery media in UEFI mode, with both the external backup drive and the SSD drive connected then restoring the backup to the SSD again is one option you can try. A variation on this option would be to disconnect your HDD, connect the SSD to the cables used by the HDD so that the SSD is now the internal drive, then boot from the Recovery media with your external backup drive connected, and then restore your backup to the internal SSD drive. This means that no further changes can occur to the HDD during this process. See this shot attached and tell - what recover ? Track 0 and the EFI System Partition - if recovering to the original non-booting HDD. How recover from rescue media the ext hdd backup ... Not to pc's hdd but to ssd usb3 ...? Leonidas, to recover from the rescue media to your new SSD connected via SATA, then you need to boot from the rescue media in UEFI mode, with your external backup drive connected. After that, follow the steps shown in the attached PDF document. This was written when using ATI 2017 and doing a recovery for a MBR drive, but the steps remain the same when using ATI 2018 or 2019, and for recovering a GPT drive. Without needed again recovery from ext hdd to ssd? I got message can Not repair see attachment ... what to do... Keyboard and mouse now Not work.... how go advanced or shutdown... ??? I completed RECOVERY TO SSD from USB3 EXT HDD backup success...!!! 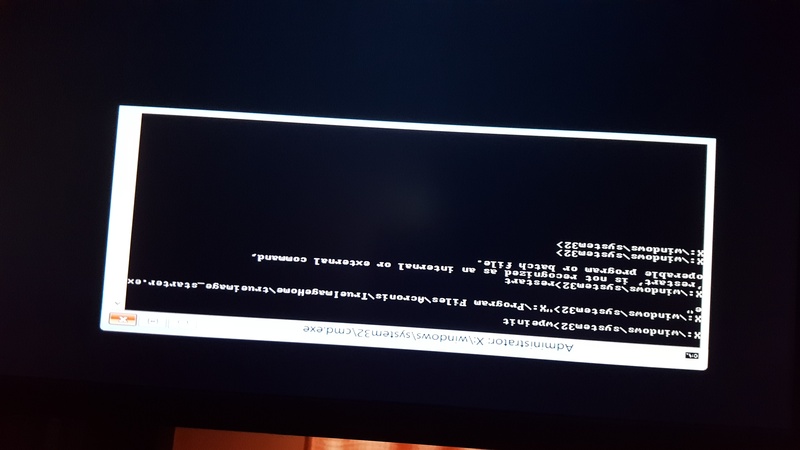 Leonidas, your boot menu from the SSD does not show an option for the 'Windows Boot Manager' which is what you need for a valid UEFI boot into Windows. 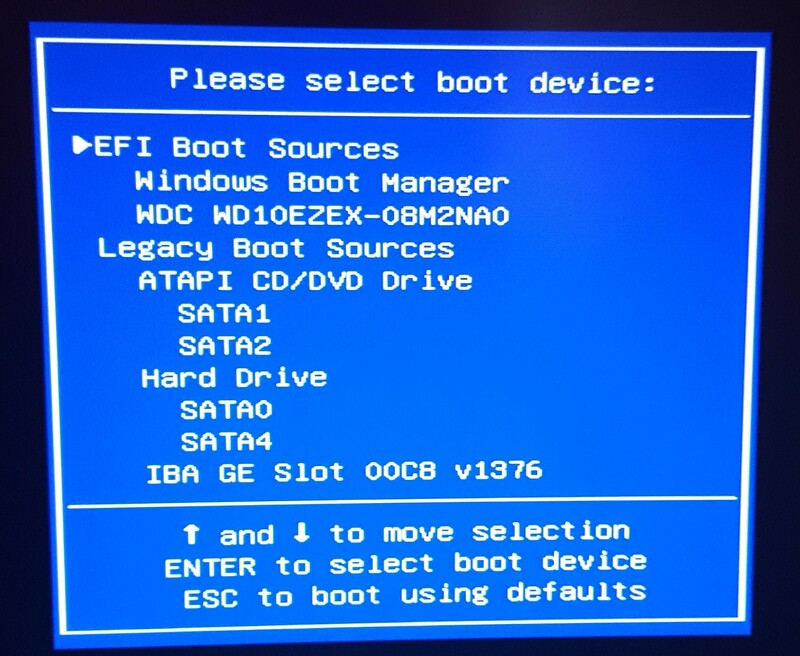 Your boot menu from the HDD did show this option, so you may need to go into the BIOS settings and check whether this option is available to be selected from the new SSD. It would also be worth clicking on the > next to your new SSD in the EFI Boot Sources to see if this expands to give other options? If this doesn't help, then boot from your Windows 10 1809 DVD and take the repair option. What to do now in windows 10....??? interchange hdd with ssd since now ssd is sata but I have Not yet fit it in... ??? Leonidas, not sure what exactly you have done here? If you have booted from the Windows 10 Install DVD and taken the Upgrade option, this would normally do a clean install of Windows - to Upgrade an existing Windows installation, this should normally be done from the Windows desktop. If you have the SSD booting to the Windows desktop and all looks good, then installing the SSD in your computer case in place of the HDD would be the next step. keep great tools great work ! Leonidas, that is good to hear. Please ensure you make a new full disk backup of your new working SSD and Windows 10 OS in case of any problems in the future. Yes, doing that should be fine and is the best way of avoiding any disk signature clash. Once you have all the data copied from the HDD, then you could re-format it and use it as you wish as a spare or a data drive. AGAIN MAY HAVE CONFLICTING PROBLEMS???? WHAT TO DELETE FROM THIS OLD HDD ? in other words if NOT the same PC may also appear conflicts if the other PC is also Windows 10 ???? There would be no conflicts if moving the HDD to a different computer - the conflict would only be a risk if the HDD and SSD were both in the same system and have the same disk signature. Thank you Steve for your patience and detail. I searched high and low for a solution to what was supposed to be an easy clone and replace for a Toshiba Laptop. You MVP Tools are perfect step by step descriptions that are clear and easy to understand. Finally having a bootable USB media to facilitate the clone it worked on the first try with no issues. Now the machine is lighting fast by comparison. Thank you!! Mark, welcome to these public User Forums. Thank you for your feedback and always good to hear of success in using the tools! Can give him my Acronis bootable media CD/DVD to make the clone WITH-OUT Having Acronis TI2018 in his PC? recommended backup disk first [POWER CUT MAY MAKE BOTH SSDs PROBLEM]? needed check source SSD for errors first? or > SIMPLE is about the same? If go ADVANCED - I think needed download WADK is easy this? - also a CDR is enough or needed DVD-R ? Are you strictly recommend Rescue Media Builder > ADVANCED... if used the media for cloning A different PC??? for CLONING a differ PC From its SSD to a usb3/sata SSD bigger???? I think this is easier... Or better do the bootable rescue media > ADVANCED ? AND DOWNLOAD BOOTABLE MEDIA ???? THIS IS FOR ANY PC ???? Strictly speaking your Acronis software / media is licensed only to you for use on the number of systems that you have purchased the license for. It is not licensed for use on a friend's PC. Acronis Universal Restore is not needed for cloning drives that will be used in the same computer - this is intended to help in migrating to new computer hardware (motherboard, CPU, etc is different). The Acronis Rescue Media ISO file that you can download from your Account page is based on the older Linux kernel method, not using Windows PE as the media created by ATI 2018 in Windows would default to making. This should still work with most computers unless they have any RAID or some NVMe M.2 type SSD drives for which the media does not have driver support. AND DOWNLOAD BOOTABLE MEDIA, THIS IS FOR ANY PC and can used without problems to clone SSD 100GB to SSD 1TB [not nvme and not Raid] ???? ATTENTION ! EVEN I HAVE NOT INSTALLED ACRONIS TI 2018 DUE TO NO SPACE ON OLD SSD C:/??? Where see how many licenses Left... from the pack of 5-Acronis TI2018 i purchased???? here https://eu4-cloud.acronis.com/bc/#m=Resources&s=1&key=all in dashboard ONLY 4 PCs backup show ... meaning i have one license unused ??? needed check source the old SSD for errors first before cloning? SSD drives do not normally suffer from the same problems as older HDD spinning disks with such as bad sectors etc, but you should run a CHKDSK /F for the drive to ensure there are no logical file system issues before cloning. I would always recommend to make a full Disk backup of the source SSD too - this is your safety net in case of any errors or issues during the cloning process. If follow the same procedure - normally Acronis clone media should shrink disks appropriately from 500GB HDD to 250GB SSD ... ? Yes, it should resize during the cloning process provided there is sufficient free space available to do this. I would do a CHKDSK /F for the 500GB HDD plus also make a full disk backup before starting to do the clone.